Where I live,in Oregon, halfway between the north pole and the equator, the longer hours of light and the plants bursting with flowers and new leaves bring relief and, for me, renewed energy. It's a powerful time of year and a powerful day. There's more, because this weekend some earthlings will have witnessed a solar eclipse. Others will have gazed at the bright lights of planets in the night sky. Billions will soon see a partial lunar eclipse. On such solar events I'm impressed that we as individuals, measured against the vast tracts of space, are but tiny specks. But as an exploding population, humanity can overwhelm the load limit of our fragile little space vehicle and knock its essential systems out of balance. 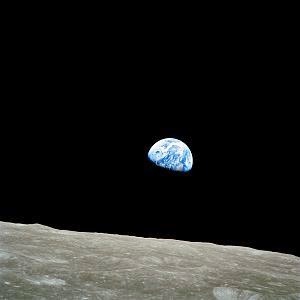 "Earthrise," taken by Bill Anders from spaceship, NASA, 1968, public domain via Wikimedia Commons. 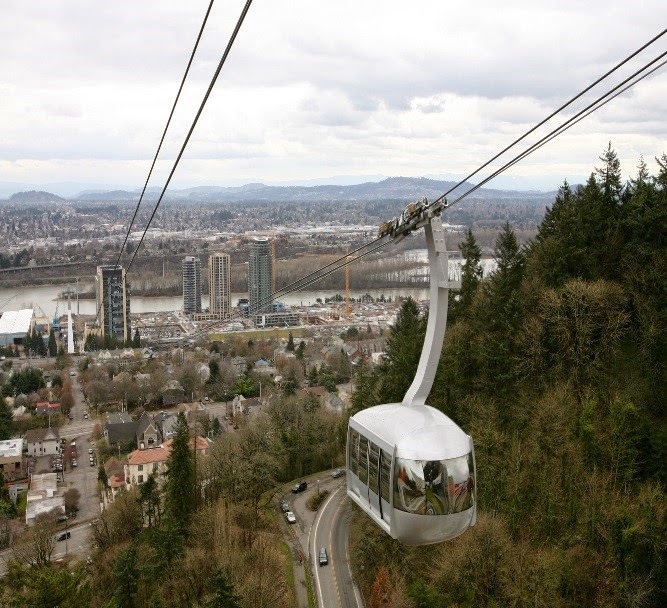 Yesterday I rode an aerial tramway from the riverfront to a hilltop in the city of Portland. The cabin accommodates about thirty passengers. One passenger boarded in a wheelchair. A couple of others brought bicycles on board. It's understood that every single passenger must cooperate to keep the trip fun and safe. If we failed to respect each other and the limits of the cabin itself, the trip could get ugly or even dangerous very quickly. My generation and future generations will have to concentrate on maintaining voluntary order among the passengers on our earth, a sort of spacial aerial tram, just as my and future generations will have to face the challenges of conserving the resources and sharing them more equally. Adlai Stevenson, Barbara Ward, Kenneth Boulding and many other futurists have probed that future. It's up to religious, political and social leaders of all countries and movements to apply the lessons. What a day to be alive on the equinox of Friday, March 20, 2015.